It is important not only to use a dog urine remover to eliminate the stain immediately (when possible), but it is also important to successfully re-train your pet to avoid those areas in the future. � Find all soiled areas using your nose and eyes. A black-light bulb will usually show even old urine stains. Turn out all lights in the room; use the black-light to identify soiled areas and lightly outline the areas with chalk. � Clean the soiled areas appropriately to remove the odors (see below). � Make the areas soiled unattractive and/or unavailable to your dog. � Make the appropriate "bathroom" area attractive � Teach your pet the appropriate place to eliminate by using positive reinforcement for your pet. As long as your pet can smell that personal scent, he'll continue to return to the "accident zone." Even if you can't smell traces of urine, your pet can. 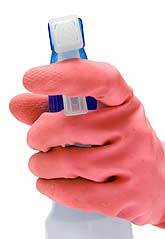 Your most important chore is to remove (neutralize) that odor. � Machine wash as usual, adding a one pound box of baking soda to your regular detergent. If possible, it's best to air dry these items. � If you can still see the stain or smell the urine, machine wash the item again and add an enzymatic cleaner. Be sure to follow the directions carefully. This is probably your best bet for a dog urine remover. � During the re-training period, a good way to discourage your pet from using the bedding is to cover the bed with a vinyl, flannel-backed tablecloth. They're machine washable, inexpensive and unattractive to your pet. � Soak up as much of the urine as possible with a combination of newspaper and paper towels. The more fresh urine you can remove before it dries, especially from carpet, the simpler it will be to remove the odor. Place a thick layer of paper towels on the wet spot and cover that with a thick layer of newspaper. Stand on this padding for about a minute. Remove the padding and repeat the process until the area is barely damp. � If possible, take the fresh, urine-soaked paper towel to the area where it belongs - your dog's designated outdoor "bathroom area" - and let your pet see you do it. Don't act angry when you do this, but try to project a "happy" attitude to your pet. This will help to remind your pet that eliminating isn't a "bad" behavior as long as it's done in the right place. � Rinse the "accident zone" thoroughly with clean, cool water. After rinsing, remove as much of the water as possible by blotting or by using a "wet-vac," "shop-vac" or "extractor." � To remove all traces of old chemicals and clean old or heavy stains in carpeting, consider renting an extractor or wet-vac from a local hardware store. This machine operates much like a vacuum cleaner and is efficient and economical. This is probably one of your best bets as a dog urine remover. � Extracting/wet-vac machines do the best job of forcing clean water through your carpet and then forcing the dirty water back out again. When using these machines or cleaners, be sure to follow the instructions carefully. Don't use any chemicals with these machines � they work much more effectively with plain water. � Once the area is really clean, you should use a high-quality pet odor neutralizer available at pet supply stores and on the Internet. (Just search for dog urine remover). Test the affected surface for staining first, and read and follow the instructions. � If the area still looks stained after it's completely dry from extracting and neutralizing, try any good carpet stain remover as a finishing touch in your quest for a dog urine remover. � If urine has soaked down into the padding underneath your carpet, your job will be more difficult. You may need to remove and replace that portion of the carpet and padding. If the wood on your furniture, walls, baseboard or floor is discolored, the varnish or paint has been affected by the acid in the urine. You may need to remove and replace the layer of varnish or paint. Employees at your local hardware or building supply store can help you identify and match your needs with appropriate removers and replacements. Washable enamel paints and some washable wallpapers, may respond favorably to enzymatic cleaners. Read the instructions carefully before using these products and test them in an invisible area. Remember that the love and companionship your dog gives you is well worth the effort you expend in cleaning up after him (or her).